Posting my writing on Wattpad. I recently posted a little snippet of some fan fiction that I had written a few years ago but never did anything with. Enjoy! I have so much I have been meaning to post but I have been posting stuff on Twitter instead of on here. Hopefully I’ll have the time to update soon. I just changed my Twitter username from GushOnline_com back to my old username which is GhostInDaylight. I still have access to GushOnline_com but it is my old account now. I switched the usernames between the accounts. I’ve been thinking about changing the name of this website to GhostInDaylight.com. I already own GhostInDaylight.com and it redirects here but I may change the header and everything. Not sure yet. TL;DR: Favorite videos below, new Pentatonix album October 16th. I’ve known of Pentatonix (an a cappella group who takes a cappella to a whole new level) for a few years now, ever since I came across their cover of “Somebody That I Used To Know” by Gotye (video below). I loved their cover and thought all of them were exceptionally talented but didn’t really look into them at the time. A few days ago I heard their new song “Can’t Sleep Love” (video below) and found out they have a new album coming out on October 16th that I believe is going to be predominately originals. My understanding is the regular version of the new album is all originals but the deluxe version has a few covers added to it. Most of their other albums have been covers with a few originals here and there. So, over the last few days I have been checking out their videos on YouTube and I have bought a ton of their stuff from iTunes. I. am. addicted. I am so impressed with their talent and drive. It astounds me that Avi and Kevin can do the entire rhythm section with just their voices. I think they all have amazing voices that mesh so well together that I think they could sing just about anything. With each of their individual talents I think they are the perfect five people to be doing what they are doing. The more I look into their stuff the more impressed I am. Here are some of my favorite videos I have come across so far. FYI: The songs will sound better with headphones unless you have really good speakers. Sometimes it’s hard to hear Avi’s bass parts without headphones. This is one of my absolute favorites. It’s an original of theirs from their album PTX, Vol II. I can’t believe there are no instruments except for their voices. I would never have guessed this was all done a cappella if I had just heard it on the radio. I love Mitch’s vocals. I keep giving myself a headache trying to sing his high parts. Here is an original from their new album, Pentatonix, that will be out on October 16th. I can’t stop listening to both of these songs. Here is “Hey Momma/Hit The Road Jack” from their performance on The Queen Latifah Show from 2013. This song is on PTX, Vol. II. “Hey Momma” is an original song mashed up with “Hit The Road Jack”. I love Scott’s vocals on this song. I am just totally in love with this performance. This is one you definitely want to listen to with good headphones. Here is another one from the new album that I can’t stop listening to. This is a cover song that is only on the deluxe version of the new album. Here is another cover song from the deluxe version of the new album. I cannot wait for this to come out so I can hear all the rest of the original songs. I’m so excited!!! Here is a live version of “Aha!” (an Imogen Heap cover that’s on PTX, Vol. 1) with Christus Factus Est. as an intro. There is an original video (which I posted at the end of the blog) for this but I like the live video better. Mitch kills it. I may have to do a blog dedicated to just the live versions of this song because Mitch leaves me speechless. There are two more live versions I’ve added to the end of this blog because I couldn’t decide which to post. I think I forgot to breathe while I was watching this one. Here is them doing a Michael Jackson medley. Here is the Gotye cover from PTX, Vol. 1. They won a Grammy for this Daft Punk Medley from PTX, Vol. II. Here is a cover of Ariana Grande’s song “Problem” that’s on PTX, Vol. III. Here is their cover of “Can’t Hold Us” by Macklemore & Ryan Lewis from PTX, Vol. II. Here is “La La Latch” a Sam Smith/Disclosure/Naughty Boy Mashup from PTX, Vol. III. Here is “Dance Of The Sugar Plum Fairy” and “Carol Of The Bells”. I have always loved both of these songs and they did an awesome job covering them. “Dance Of The Sugar Plum Fairy” is on their platinum selling album That’s Christmas To Me and “Carol Of The Bells” is on PTXmas. Here is Mitch and Scott, who have their own YouTube channel called Superfruit, doing a medley of hip-hop songs sung as if it were a Broadway musical. This cracks me up. I love it. NSFW. Here is Mitch and Scott covering a Nicki Minaj/Beyoncé song. I love how versatile they are in what they sing. Here is them doing a Beyoncé medley. I absolutely love both of their voices. I wish I could buy this somewhere. Here is the whole group doing a medley for the evolution of music. Here is their cover of “Gangnam Style” by PSY. Here is a cover of a french song (originally done by Stromae) they did with Lindsey Stirling. This is one of the few songs that isn’t completely a cappella. It features Lindsey on violin and Kevin on cello. If you want to see more of Kevin playing cello while beatboxing check out his YouTube Channel. If you aren’t familiar with Lindsey Stirling you should definitely check her out too. This song is on PTX, Vol. III. Here they are doing a cover of “Radioactive” by Imagine Dragons. Here is their cover of “Starships” by Nicki Minaj that is on PTX, Vol. 1. Here is a short video showcasing Avi’s ridiculously low bass notes on their original song “Natural Disaster”. He has hit bass notes so low that he has blown out speakers with just his voice. This shows a comparison of the studio version from PTX, Vol. II and the live version that was a half step down. It is best to listen with headphones. This is not the show where he blows out the speakers but it sounds like he might have come close. More live versions of “Aha!”. The original video for “Aha!”. That’s all for now. I’m sure there will be more videos I’ll post later. Stef Sanjati, gender identity and Waardenburg Syndrome. I just came across this YouTuber and I really liked these videos and wanted to share them here. The first one is sort of a performance art piece. She is reading a poem she wrote about a bad break up while doing a make up transformation. It’s amazing. Explaining it is not going to do it justice, just watch it. The second video is her explaining Waardenburg Syndrome. The rest of the videos deal more with gender identity and show how her views have changed over time. There are more videos but I’m not going to post them all here. She is a professional make up artist and has a lot of make up tutorial videos on her channel as well. She is only 19 but I am thoroughly impressed with her intelligence, her outlook on life and how well she expresses herself. Check her out. Here is an extra video I’m adding because it’s really cute and funny. I’m adding these next two videos because I love how great her parents are. I wish everyone had such understanding parents. I’m used to hearing such horror stories about how people’s families react when someone comes out that this is really inspirational to see. Meeting Tokio Hotel Cleveland, Ohio House of Blues August 9, 2015. Check out the photos and the videos I took at the show. Click on the photos to make them larger. I am aware that they are only slightly different but I wanted to post all three. Let me know if any of them show up upside down. I had that problem earlier on mobile devices. It looked fine on my computer but when I pulled it up on my phone the photos were upside down. Not sure why. I think I fixed it but I’m not sure what the problem was in the first place so I’m not sure. It works fine on my phone now. 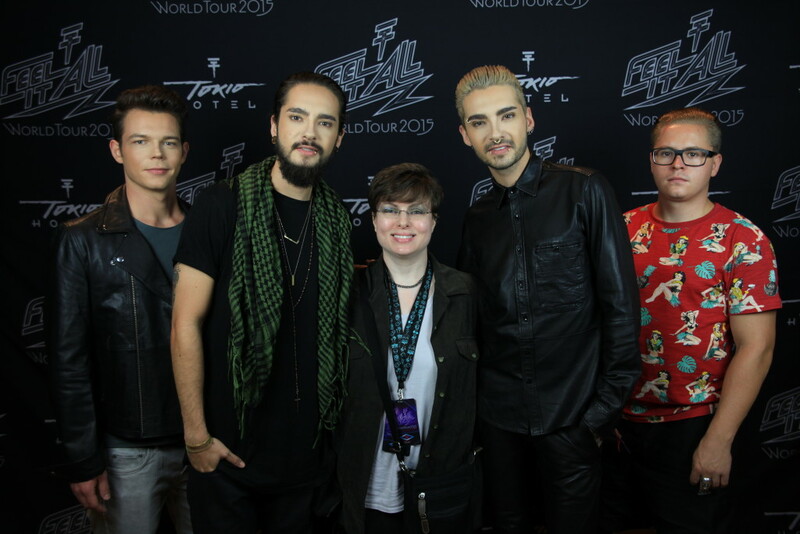 Here and here are other blog posts about Tokio Hotel. Due to language and or content some posts may not be suitable for all viewers. A good amount of the videos are not suitable for work but I do not always state NSFW so keep that in mind when viewing them. 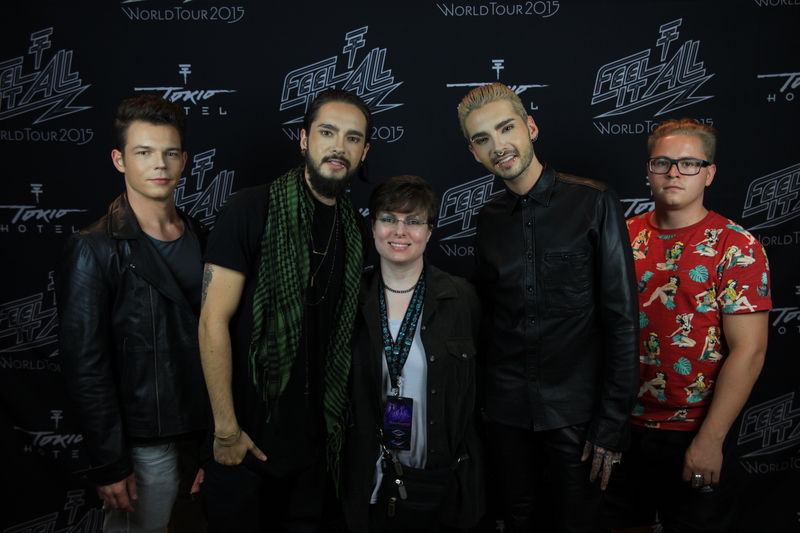 Meeting Tokio Hotel Cleveland, Ohio House of Blues August 9, 2015. | GushOnline.Com on Tokio Hotel Concert in Köln 2005. 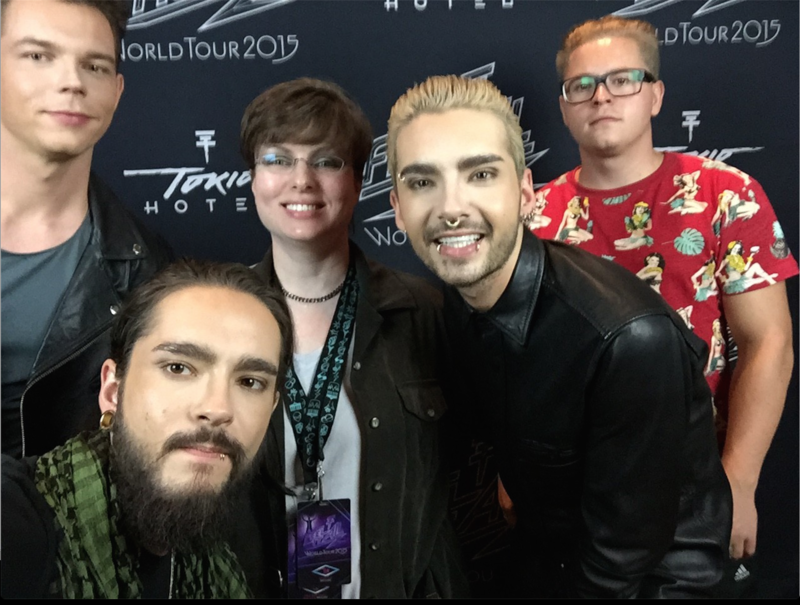 Meeting Tokio Hotel Cleveland, Ohio House of Blues August 9, 2015. | GushOnline.Com on Tokio Hotel and the cutest dog ever. My Guest Post on DGC-Adam Lambert and Tommy Joe Ratliff “Adommy” moments. | GushOnline.Com on Magic University, Harry Potter slash fiction and Daron’s Guitar Chronicles. Learning German and free college. | GushOnline.Com on Tokio Hotel and the cutest dog ever. Learning German and free college. | GushOnline.Com on Tokio Hotel Concert in Köln 2005. Copyright © 2019 GushOnline.Com. All Rights Reserved.